I realize that such exercises are probably “click-bait,” but I generally can’t resist taking tests/quizzes designed to identify my philosophical/political orientation. Here are some previous examples, all of which made sense. But there was also a political quiz that pegged me as a “moderate,” which might be reasonable conclusion since libertarians have some right-wing views and some left-wing views. But that quiz also concluded that I had “few strong opinions,” which is a nonsensical result. But maybe I really am a moderate because there’s a new 20-question quiz from IDRlabs and – as you can see – I’m exactly in the middle. Are you orderly or messy? Do you prefer country music or classical music? Do you want your home on a busy street or quiet street? Are philosophical discussions fun, boring, or pointless? 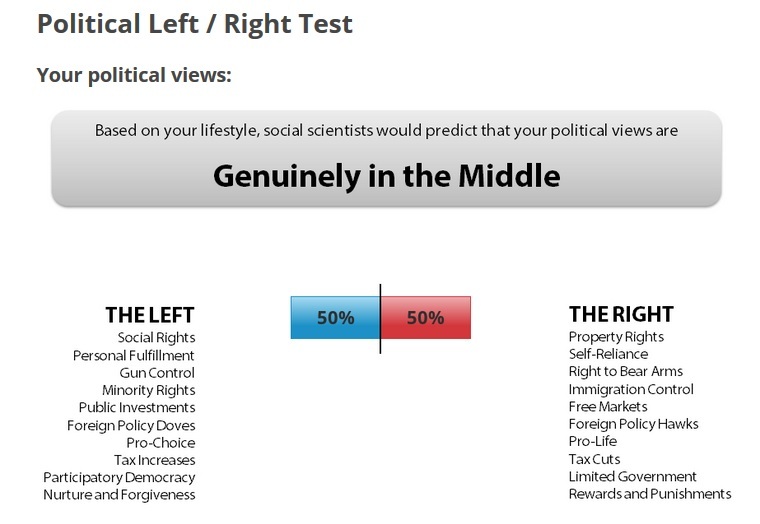 At the risk of over-simplifying, if you give answers suggesting you prefer a quiet and conventional life, you’ll get a right-wing score. And you’ll get a left-wing score if your answers suggest you have a more eclectic approach to life (and, if you’re like me, you don’t know whether you like arugula, so you have a hard time answering certain questions). For what it’s worth, I think the quiz does capture something important. There is research indicating that people’s policy views are largely determined by underlying values. And these values are more important than economics. Coming from a leftist perspective, Thomas Frank wrote What’s the Matter with Kansas last decade to address the supposed paradox of people with modest incomes voting for conservative politicians. And Thomas Edsall, also coming from the left, observed in the New York Times that wealthy people have become Democrats. So much for Marx’s theory of economic determinism! This is outside of my area of expertise, but I’m interested in this type of analysis because it’s my job to proselytize in favor of freedom. So I often try to convince right wingers to have a more laissez-faire approach to social and international matters and I often try to convince left wingers to have a more laissez-faire approach to economic issues. But how do you convince people about issues if their views are dependent on an underlying value system? And it gets more complicated because of what’s happening in society. I’ll share a couple of items that struck me as important. First, here’s some of what Peggy Noonan wrote in the Wall Street Journal. There are the protected and the unprotected. The protected make public policy. The unprotected live in it. …The protected are the accomplished, the secure, the successful—those who have power or access to it. They are protected from much of the roughness of the world. …They are figures in government, politics and media. They live in nice neighborhoods, safe ones. Their families function, their kids go to good schools, they’ve got some money. All of these things tend to isolate them, or provide buffers. …They’re insulated from many of the effects of their own decisions. …This is a terrible feature of our age—that we are governed by protected people who don’t seem to care that much about their unprotected fellow citizens. And here’s a video featuring David Goodhart of London’s Policy Exchange, who says that the split is now between the “anywheres” who are cosmopolitan and the “somewheres” who are traditional. In some sense, it seems that politics is being determined by class. The “protected” and the “anywheres” are increasingly on the left (the “rational left” rather than the Bernie variety). And the “unprotected” and the “somewheres” are voting blocs for the right. Incidentally, this worries me because elites have a disproportionate influence on public policy, And there’s now cultural pressure for such people to adopt left-wing views (a good example is the condescending tone of this Washington Post column). Simply stated, most educated people want to be seen as urbane and cosmopolitan, characteristics that are now associated with the left. And it goes without saying that Trump is probably accelerating this process – which is doubly frustrating to me because his occasional support for good policy doesn’t change the fact that he’s not a supporter of free markets and limited government. Yet because he is now an avatar for the right, many educated people will now decide they should support statist policies and candidates. The bottom line is that being an advocate for liberty is becoming an even bigger challenge! P.S. Returning to the original topic of online tests, Reason’s political candidate quiz produced a logical conclusion. P.P.S. By contrast, I thought the quiz on supposed libertarian hypocrisy was largely a straw-man exercise. There’s a Terror Wing in the Moocher Hall of Fame, so I guess it stands to reason that I should create a French Wing of the Bureaucrat Hall of Fame. 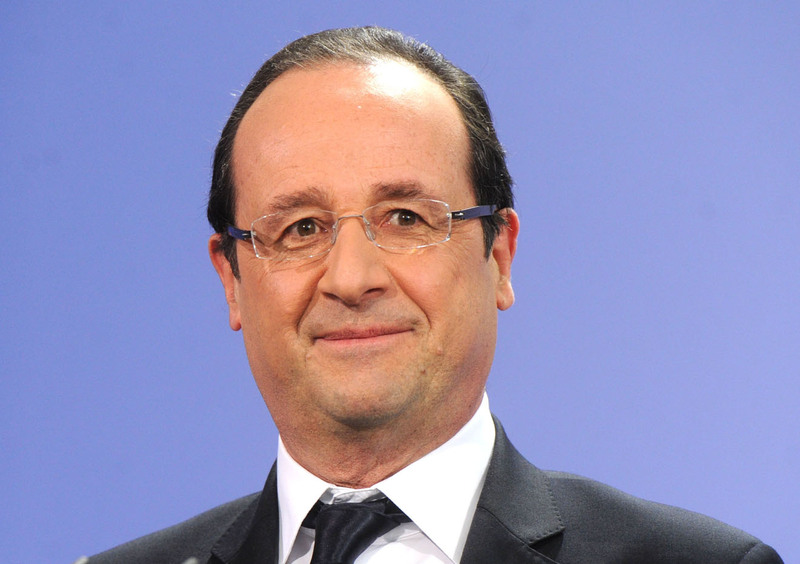 After all, few nations can compete with France in the contest to over-tax and over-spend. And a lot of that spending goes to subsidize a bloated bureaucracy. Moreover, I suspect many members of that bureaucracy work in jobs that shouldn’t exist and get wildly over-compensated. Just last month, for instance, I honored one of those bureaucrats with membership in the Hall of Fame because she managed to squander an average of $145 of other people’s money on taxis each and every day (including weekends) even though she also had a taxpayer-provided car and chauffeur! Wow. And she wasted that much money while working in a position (archivist for the country’s government-run media operation) that never should have been created. Speaking of which, here are some amusing (only amusing because I’m not a French taxpayer) snippets from a story in the U.K.-based Times about some other ultra-spoiled French bureaucrats. The 40 members of the Académie Française have…lavish perks… Their remuneration arrangements…include free flats in some of Paris’s most sought-after districts… The report, by the Court of Accounts, is likely to add to widespread resentment of a Parisian elite seen as clinging to its privileges. The pay levels for these über-bureaucrats are absurd, but the perks are downright astounding. Many [flats] were made available without justification to the intellectuals who belonged to the academies and their staff, the report said. …Hélène Carrère d’Encausse, the historian who is its “permanent secretary”, received €104,768 a year and a free flat in Paris, the report said. The academy justifies her remuneration on the ground that her work is so great that she has to “renounce all literary work”. However, Mrs Carrère d’Encausse has produced nine books, largely on Russia, her specialist subject, since being given the post in 1999. …There is also criticism of Hugues Galls, the opera director who sits on the Academy of Fine Arts and runs one of its properties — the house and gardens where Claude Monet lived. The report said he received a BMW 125i, bought by the academy for €40,461. His garage fees of €1,700 a month are paid by the institution. Hey, nice “work” if you can get it. No wonder the OECD is based in Paris. The culture is perfect for elitist leeches. And it shows that my First Theorem of Government applies in France as well as the United States. The only silver lining to this dark cloud is that the French elite is slowly waking up to the reality that the government is running out of victims to finance such special-interest perks. P.S. I rarely get to celebrate good news, so let’s enjoy this moment because the government thugs who stole $107,000 from Lyndon McLellan are being forced to return the money. Reason has the wonderful details. …the federal prosecutor assigned to the case was peeved. “Your client needs to resolve this or litigate it,” Assistant U.S. Attorney Steve West wrote in an email message. “But publicity about it doesn’t help. It just ratchets up feelings in the agency. My offer is to return 50% of the money. The offer is good until March 30th COB.” That deadline came and went, but Lyndon McLellan, the convenience store owner who lost $107,000 to the IRS because it considered his bank deposits suspiciously small, refused to fold. That turned out to be a smart move, because West was bluffing. Yesterday the government agreed to drop the case and return all of McLellan’s money. This is great news, but notice what happened. The Assistant U.S. Attorney initially tried to threaten this innocent man. But as the case got more publicity, the hack bureaucrat was forced to relent, in much the same way cockroaches scurry into crevices when the kitchen light is turned on. By the way, if anyone knows Steve West, make sure to let him know that he’s a despicable human being. I bet he’s friends with Robert Murphy and Michael Wolfensohn. Last year, while writing about the sleazy and self-serving behavior at the IRS, I came up with a Theorem that explains day-to-day behavior in Washington. It might not be as pithy as Mitchell’s Law, and it doesn’t contain an important policy prescription like Mitchell’s Golden Rule, but it could be the motto of the federal government. I realize this is an unhappy topic to be discussing during the Christmas season, but the American people need to realize that they are being raped and pillaged by the corrupt insiders that control Washington and live fat and easy lives at our expense. If you don’t believe me, check out this map showing that 10 of the 15 richest counties in America are the ones surrounding our nation’s imperial capital. Who would have guessed that the wages of sin are so high? But even though the District of Columbia isn’t on the list, that doesn’t mean the people actually living in the capital are suffering. Here are some interesting nuggets from a report in the Washington Business Journal. D.C. residents are enjoying a personal income boom. The District’s total personal income in 2012 was $47.28 billion, or $74,733 for each of its 632,323 residents, according to the Office of the Chief Financial Officer’s Economic and Revenue Trends report for November. The U.S. average per capita personal income was $43,725. Why is income so much higher? Well, the lobbyists, politicians, bureaucrats, interest groups, contractors, and other insiders who dominate DC get much higher wages than people elsewhere in the country. And they get far higher fringe benefits. In terms of pure wages, D.C., on a per capita basis, was 79 percent higher than the national average in 2012 — $36,974 to $20,656. …Employee benefits were 102 percent higher in D.C. than the U.S. average in 2012, $7,514 to $3,710. Proprietor’s income, 137 percent higher — $9,275 to $3,906. …The numbers suggest D.C. residents are living the high life. Now let’s share a chart from Zero Hedge. It uses median household income rather than total personal income, so the numbers don’t match up, but what’s noteworthy is how DC income grew faster than the rest of the nation during the Bush years and then even more dramatically diverged from the rest of the country during the Obama years. In other words, policies like TARP, the fake stimulus, and Obamacare have been very good for Washington’s ruling class. Want some other concrete examples of profitable Washington sleaze? Well, here are some excerpts from Rich Tucker’s column for Real Clear Policy. The real place to park your money is in Washington, D.C. That’s because the way to get ahead isn’t to work hard or make things; it’s to lobby Washington for special privileges. Look no further than the sweet deal the sugar industry gets. It’s spent about $50 million on federal campaign donations over the last five years. So that would average out to $10 million per year. Last year alone, the federal government spent $278 million on direct expenditures to sugar companies. That’s a great return on investment. Big Corn may get an even better deal than Big Sugar. Then there’s ethanol policy. Until 2012, the federal government provided generous tax credits to refiners that blended ethanol into gasoline. In 2011 alone, Washington spent $6 billion on this credit. The federal government also maintains tariffs (54 cents per gallon) to keep out foreign ethanol,and it mandates that tens of billions of gallons of ethanol be blended into the American gasoline supply. Nothing like a federal mandate to create demand for your product. How much would you pay for billions of dollars worth of largesse? Well, the ethanol industry got a steep discount. In 2012, opensecrets.org says, the American Coalition for Ethanol spent $212,216 on lobbying. Rich warns that the United States is sliding in the wrong direction. What makes Washington especially profitable is that its only products are the laws, rules, and regulations that it has the power to force everyone else to follow. …we seem to be sliding toward what the authors term “extractive” institutions. That means government using its power to benefit a handful of influential individuals at the expense of everyone else. And let’s not forget that some people are getting very rich from Obamacare while the rest of us lose our insurance or pay higher prices. This Reason TV interview with Andrew Ferguson explains that there is a huge shadow workforce of contractors, consultants, and lobbyists who have their snouts buried deeply in the public trough. I particularly like his common sense explanation that Washington’s wealth comes at the expense of everyone else. The politicians seize our money at the point of a gun (or simply print more of it) to finance an opulent imperial city. So if you’re having a hard time making ends meet, remember that you should blame the parasite class in Washington. P.S. The insider corruption of Washington is a bipartisan problem. Indeed, some of the sleaziest people in DC are Republicans. P.P.S. Though scandals such as Solyndra show that Obama certainly knows how to play the game. P.P.P.S. Making government smaller is the only way to reduce the Washington problem of corrupt fat cats. Whether they’re banning bake sales, federalizing school lunch menus, or criminalizing Big Gulps, the nanny-staters feel they have some special wisdom that gives them the right to tell other people how to live their lives. This irks libertarians since we value human liberty, even if it means people sometimes make foolish choices. But so long as you’re not interfering with someone else’s rights, we don’t think government should dictate your private behavior. Parternalists obviously disagree. For a very reasonable explanation of this mindset, here’s some of Cass Sunstein’s work, as excerpted by The New Republic. What seems to unify paternalistic approaches, however diverse, is that government does not believe that people’s choices will promote their welfare, and it is taking steps to influence or alter people’s choices for their own good. In other words, people are sometimes dumb and the government at the very least needs to nudge them in the right direction. Sunstein outlines the objections to this approach, largely focusing on the fact that the market process will discourage bad behaviors. To the committed antipaternalist, government should not short-circuit the valuable process of learning by doing. If people make mistakes about diets, drinks, love, or investments, they can obtain valuable lessons, and those lessons can make their lives a lot better. …In a market economy, companies compete with one another, and people are free to choose among a wide range of options. If a car has terrible fuel economy, and if it costs a lot of money to operate, fewer people will buy it. As a result, companies will produce more fuel-efficient cars. Some consumers may be fooled or tricked, but in the long run, free competition and open markets will help. On this view, paternalism presents a major risk, because it may freeze the process of competition. Not surprisingly, Sunstein argues that the market process is sometimes inadequate. …even if we are inclined to think that individuals are generally the best judges of how to make their own lives go well, the word generally is important. With that qualification, we can see that the objections to paternalism depend on some empirical judgments. …The relationship between freedom of choice and welfare is being tested, with complex results. Sometimes people’s means do not promote their own ends. Behavioral economists have identified a number of reasons that people’s choices do not always promote their welfare. …sometimes we fail to take steps that really are in our interest. Human beings often procrastinate, and the long-term may not be so salient to us. We can be tempted by emotional appeals. Sometimes we do not take steps that would make our lives go a lot better. If welfare is our guide, means paternalism might be required, not forbidden. To be fair, Sunstein recognizes that many antipaternalists are motivated by freedom, not some abstract measure of human welfare. Suppose that we are not so focused on welfare and that we believe that freedom of choice has a special and independent status. We might think that people have a right to choose, even if their choices cause harm, and that government cannot legitimately intrude on that right, even if it does in fact know best. …Many of the most deeply felt objections to paternalism are based on an intuition or judgment of this kind. They often take the form of a question: By what right can government legitimately interfere with the choices of free adults? This passage captures my view. I actually agree with paternalists in that there are lots of people who make bad choices. I think a major problem is that these people over-value the positive feelings they get from “bad” behaviors today and under-value the harm that those behaviors will cause in the future. At the risk of making a sweeping judgement, I even think the biggest barrier to upward mobility is that some people don’t have a properly developed sense of deferred gratification. So I think paternalists often are right, but I disagree with the notion that government should coerce people and impose “good” choices. Simply stated, freedom and liberty matter to me. Actually, to be perfectly honest, I won’t defend to the death your right to be foolish. But I’ll surely write a snarky blog post. Let’s close by acknowledging there are some gray areas. 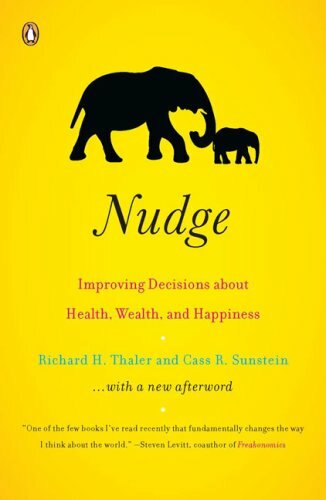 What about the idea that government can “nudge” us to make better choices? A classic example is a government rule to automatically sign new workers up for things such as 401(k) plans, but then give them the ability to opt out. I don’t want government to interfere with private employment contracts, but that type of policy is obviously not nearly as objectionable as banning Big Gulps. And you can come up with other proposals that might even pass muster with rabid libertarians. If a high school has a consumer finance class that teaches people about compounding and present value, that presumably will nudge them to be more pro-saving. Is there anything wrong with that? Probably not, though we hard-core libertarians would argue that such lessons presumably would be part of the market-based education system. In other words, there’s a reason why our answer to just about every question is “less government.” Not only is that a good philosophy, it’s also the way of getting the best results. P.S. If Sunstein’s name sounds familiar, it may be because I have criticized him for endorsing more redistribution based on FDR’s awful Economic Bill of Rights. On the other hand, I have favorably cited his research to show that too much regulation can cause needless deaths. Way back in 2010, I savaged Prince Charles for being the ultimate Limousine Liberal. He lives off the taxpayers while traveling on private jets so he can pontificate about the need for ordinary people to live bleaker lives in order to appease the environmental gods. And if someone asked me about the taxpayer cost of maintaining England’s royal family compared to the equivalent numbers for President Obama and his family, I would have guessed the royal family was more expensive. I would have been wrong. Here’s an excerpt from a story in the Daily Caller. I hope that these numbers are wrong. Indeed, it wouldn’t be fair to add the policy staff of the White House (even though I’m sure it could be cut in half) when making comparisons of the care and upkeep of the Obamas and the royal family. 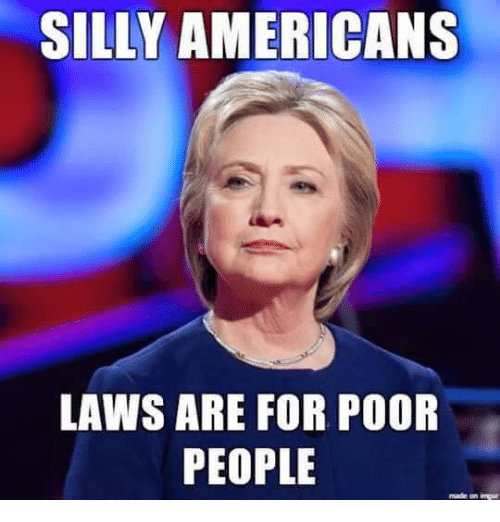 But there’s definitely a big kernel of truth to the charge that politicians are leading lives of privilege and elitism compared to the peasants that finance their pampered existence. 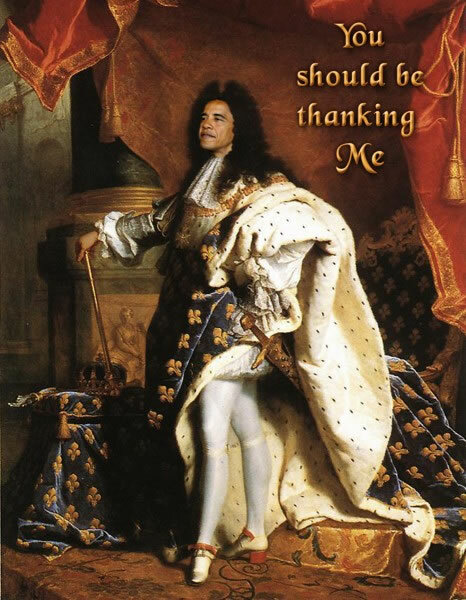 To add insult to injury, they exempt themselves from the laws they impose on the rest of us, such as the decision that some White House vehicles will be exempt from Obama’s directive that the federal government purchase only green cars. Keep in mind, though, that it’s not just Obama. The Bush White House also was guilty of extravagance, albeit perhaps at a lower level. But the big numbers, in terms of the burden on taxpayers, come from the giant army of overcompensated federal bureaucrats. And you need to consider the mass of lobbyists and consultants that also are part of the corrupt Washington machine. No wonder, as shown in this map, most of the richest counties in America are those surrounding Washington.